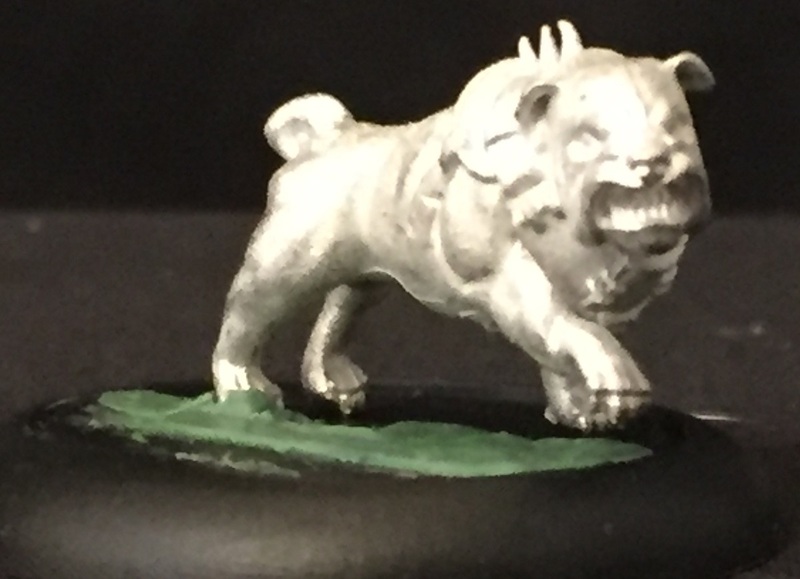 In the world of Guild Ball, warfare has been replaced with the sport of Guild Ball. Think of the game, thematically, as a mix of soccer, hockey, and rugby. Players on either team are looking to score goals by kicking a ball into a goal spot on the field. Points can also be gained by beating up enemy players. Goals are worth 4 points apiece, while “knocking out” an enemy is worth 2 points. The standard game is played to 12 points. Teams are made up of 6 players. Teams must include one captain (that dictates the Guild your team is considered) and five other players, one of which is a team mascot. Yes, the team mascots actually get out there on the field and play. Though these aren’t foam-suited humans. These are actual snakes and otters and bulldogs. Individual players don’t have a points cost. Each player is, essentially, “free.” You just have to decide who you want to use. All players must be from the same guild as the team captain. However, The Union has players that will also work for other Guilds. Think of them as a “mercenary” faction that can also field strictly Union teams as well. 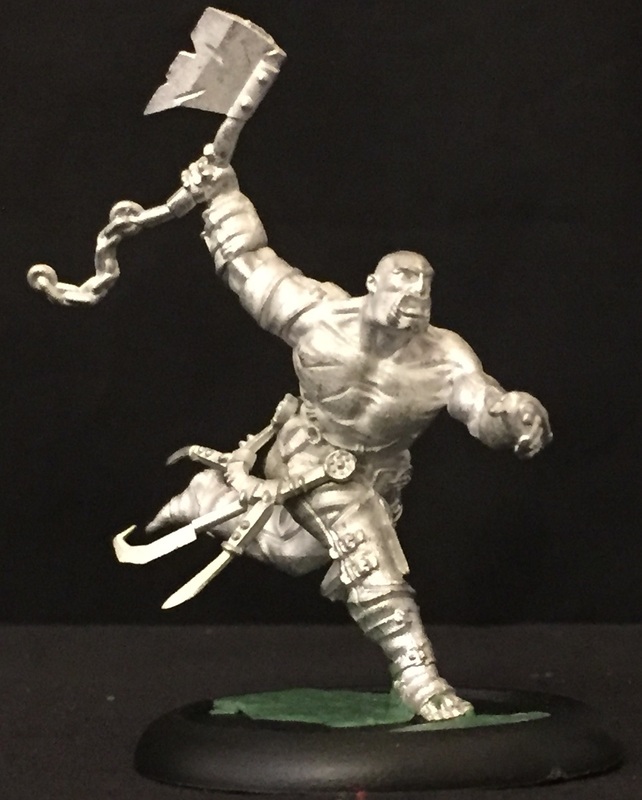 The models for the game are currently all pewter (though you can get resin versions of some of the players in the Steamforged webshop). I didn’t realize it until I started putting these figures together, but I’d not dealt with just-pewter figures for quite a long time. 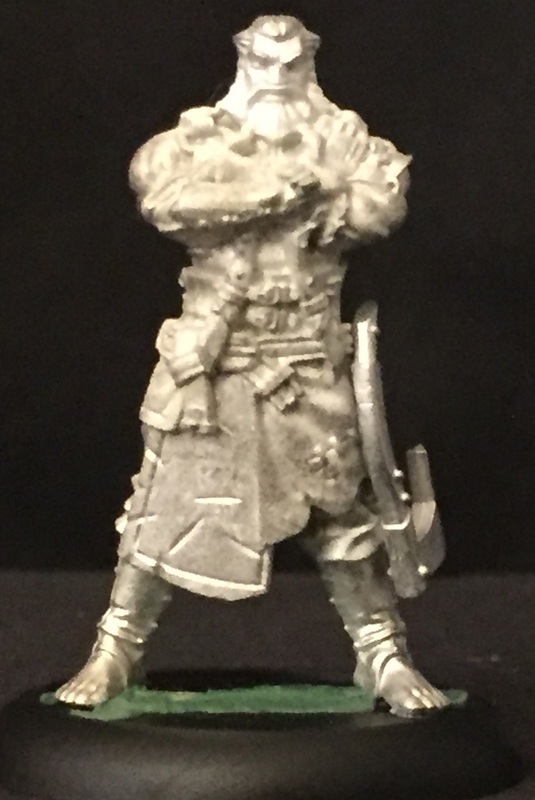 I’ve been mostly dealing with plastic or figures that were a mix of plastic, pewter, and resin. Assembling the figures was pretty easy. All of the joints went together smoothly. There was very little flash on the figures and almost no mold lines. The pieces are rather lithe (for the most part) and so the connection points aren’t very big. I’ve only had one piece that seems like it’s just gonna be “the part that breaks.” All the rest have held together rather well. 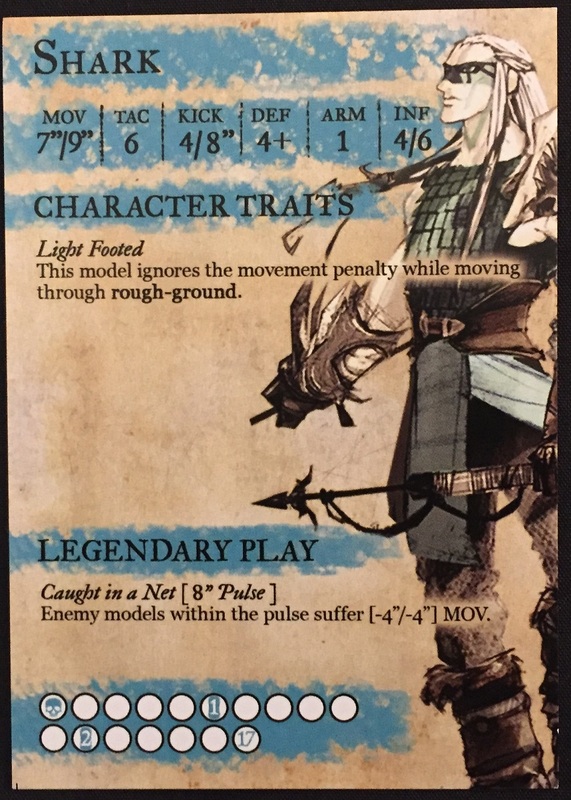 Each model also comes with a stat card that has all you’ll need to know about the figure. More on stat cards below. 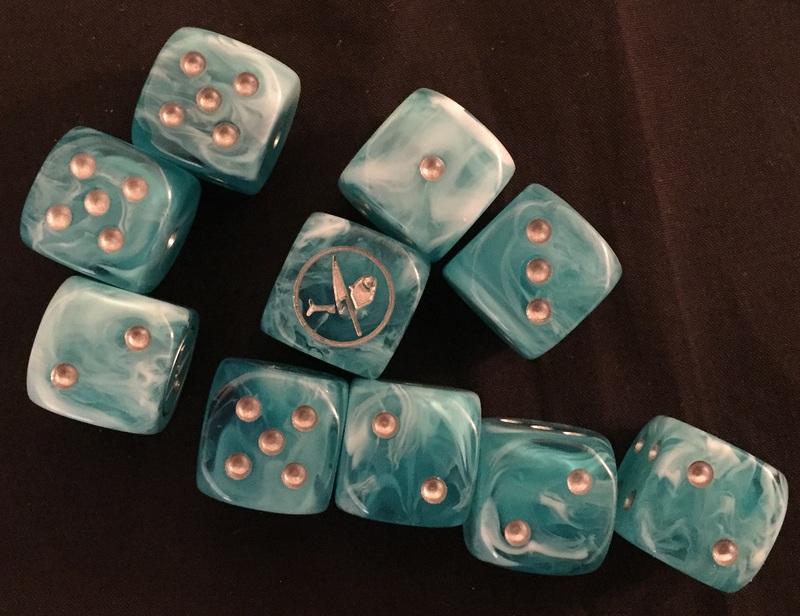 I love the fact that there are custom dice already for the teams. I was probably going to paint my Fishermen (the team I’m probably going to focus on the most) in the official colors anyway, but since I’ve got dice that match, that’s pretty much a guarantee now. You get 10 dice in a pack and most of the time you won’t be using more than that. However, certain situations on the board could end up meaning you’d need more than that, but it’s a fairly rare and extreme case. You’ll usually be rolling between 3-8 dice for most things. The token packs are indispensable. The game uses a lot of different tokens for things (details below, obviously). The team packs come with most of what you’ll need, giving you tokens for Influence, as well as many of the effects of the various team Plays (again, details below). There’s an alternative “Conditions” pack you can get for things like “bleed” and “knocked down” and such. I didn’t get one of these, but I will be in the near future, as they will be very handy. 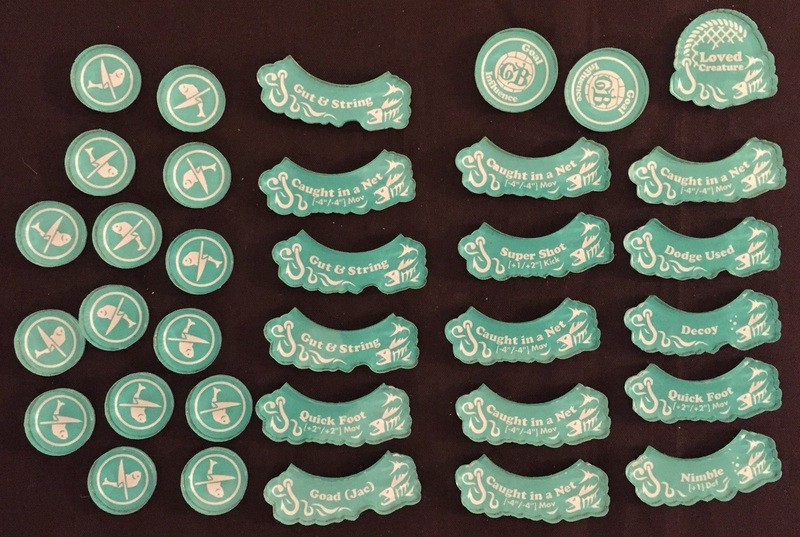 One thing about the tokens that I originally found interesting is that the plastic coating on the top wasn’t removed before shipping. 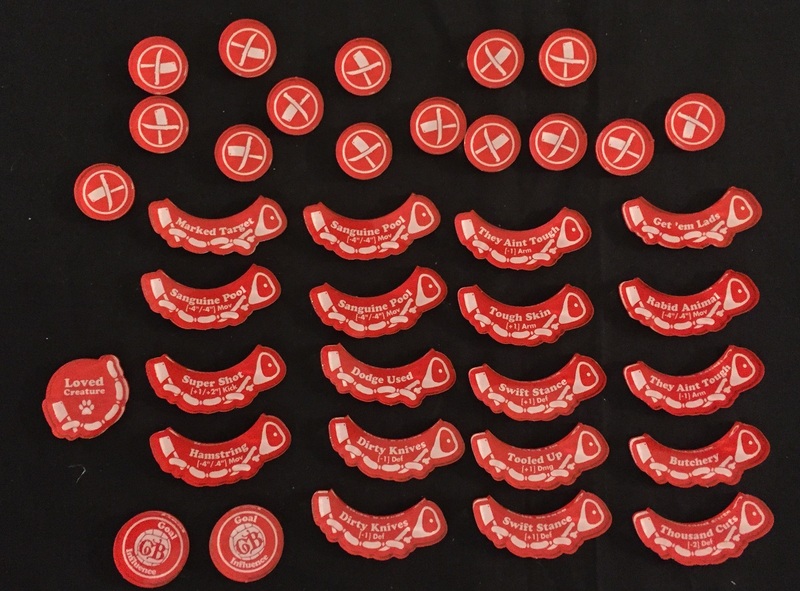 I originally thought the tokens were just rather cloudy, until I came across one with the plastic half-torn off. Then it was sort of a “duh…” moment as I realized I just needed to peel that off. 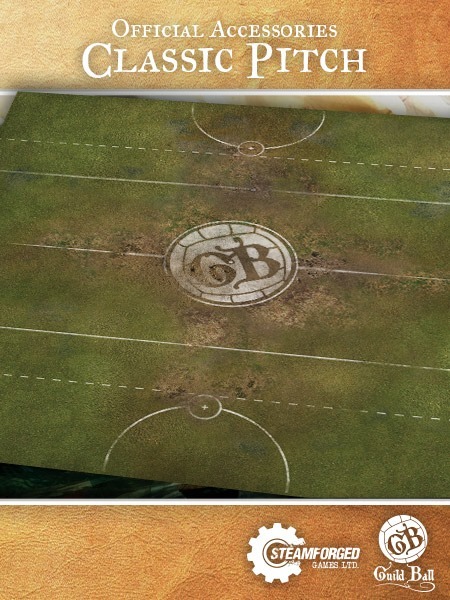 While I didn’t get one, there are playmats specifically made for Guild Ball. The standard game plays on a 3’ x 3’ table, so it’s a bit smaller than the 4’ x 4’ that many of us are used to playing on for our miniatures games. 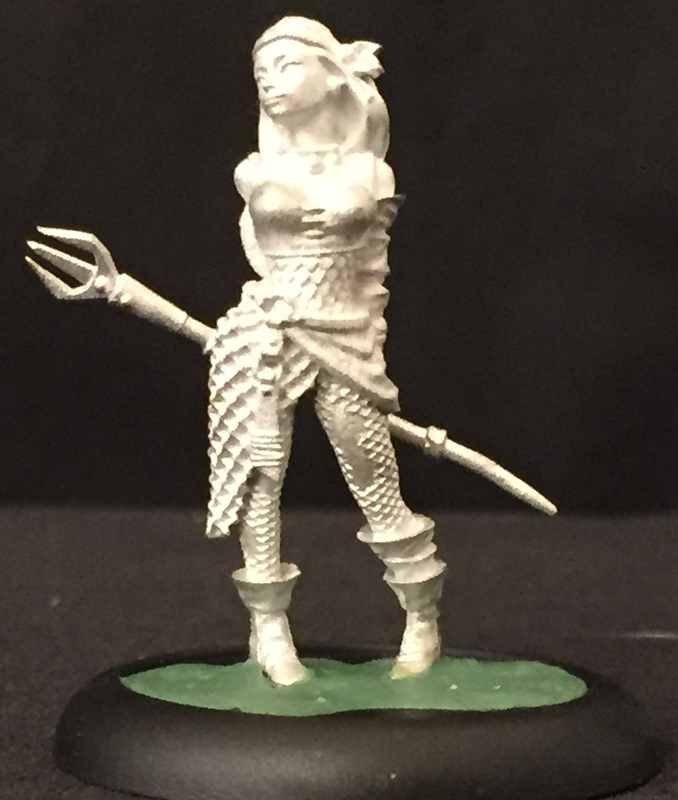 The game is not played on a grid, unlike several other “fantasy sports” miniatures games. Terrain is optional for the game. There are rules for rough terrain and obstructions and such, but if you want to play on a flat, open field, you can do that, too. The field is divided into 3 sections. A “Goal Line” is 6” up from opposite board edges. The goals, which are 50mm circles. They are placed with one edge along the goal line and halfway between the two sidelines. That’s all the different things you can get for the game (and a bit of information about the game sprinkled throughout). Let’s look at a player’s stat card and really get into the nuts and bolts of the game. Note: I have Season 1 stat cards. Season 2 stat cards are laid out slightly different, but all the same information is on them. The cards are double-sided and contain a LOT of information. Players have a lot of options for what they can do during a turn, and it really shows on these cards. Thankfully, they are fairly easy to read and once you get used to looking at them, they really are helpful. There’s really no way this game could work without the cards. Anyway, across the top there is the model’s name. Each model in the game is unique. There are no “grunt” characters. As such, only one of each character can be on your team. Below that we have the stat block. Now, there’s a lot of numbers here, so let’s go through them. MOV: This is the character’s movement. The first number is their standard movement. The second number is their maximum movement. As you can tell by the little marks, this game is played using inches. KICK: The first number here is the number of dice you get in your dice pool when wanting to kick the ball (for passing, scoring goals, or just trying to get the ball to a certain part of the field). The second number is the maximum distance the model can kick the ball (once again, in inches). 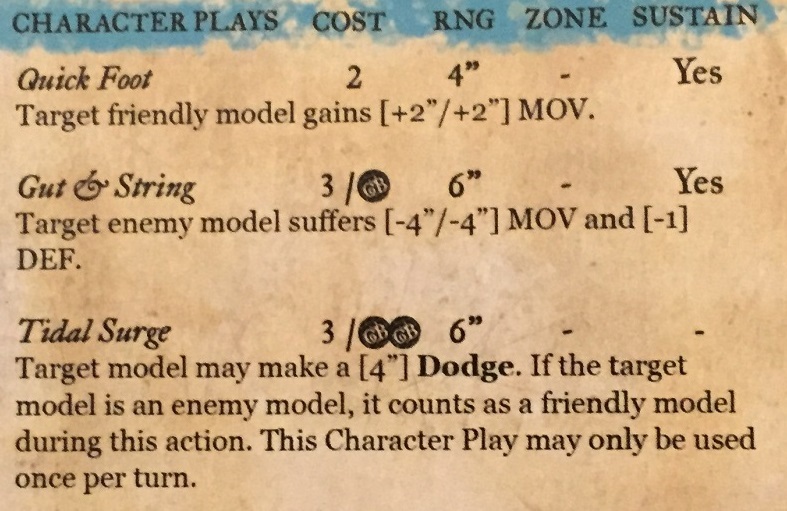 DEF: This is the target number opponents will need to roll when trying to attack this model. This includes regular attacks as well as Character Plays (more on those in a little bit). As you can tell by the “+” sign, this is an “equal or beat” sort of situation. ARM: This is a model’s armor. When an enemy makes an attack against you, subtract this target’s ARM value from the total number of hits. (Example: In the case of an ARM 1 character, if an opponent rolls 4 hits, that would be reduced to 3). INF: This is a model’s Influence. 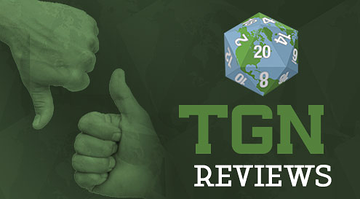 Influence is what makes the Guild Ball world go ‘round. 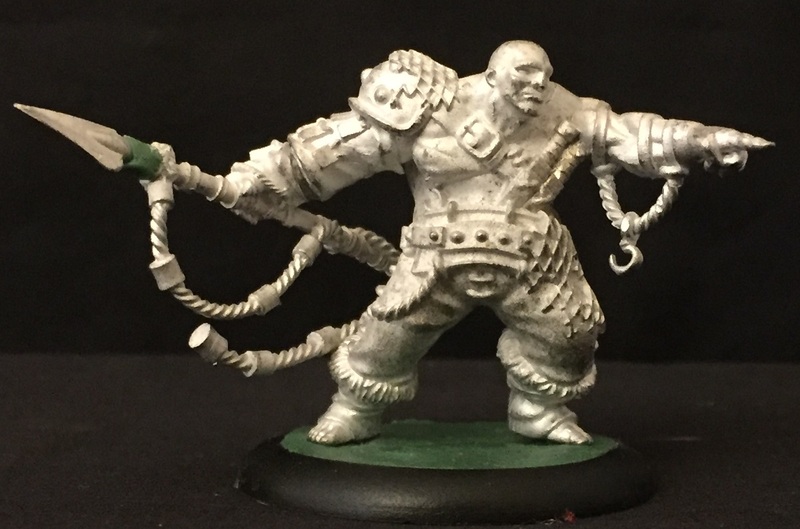 For those that have played Warmachine/Hordes, you can think of Influence like Focus/Fury. While a model can always make at least a Jogging move (up to their standard movement) during their turn, if they want to kick the ball or make an attack or use one of their Character Plays, they’ll have to spend Influence. The first number is the amount that the model adds to the Influence Pool at the start of a turn, while the second number is the Maximum Influence that character can have at any one point. Ok, moving along, we get to the Character Traits. These are special abilities that are “always on.” They don’t have to be specifically activated by the model in order to be used (so they don’t cost Influence, for example). There’s as many different of these as there are players. Many of them involve synergy bonuses with other players. Someone might gain extra ARM or DEF or even INF when they’re around other certain players. Certain characters are just that much more awesome. They have Legendary Plays. For you Warmachine fans, think of this like a Warcaster’s Feat. Once during the game, during that model’s activation, they can use their Legendary Play. Each one’s different and they’ll tell you exactly how they work on the card. Down at the bottom of the card is the character’s damage track. Player are going to take hits during the course of the game, many of which will result in damage being done. Players start out at full health (obviously). As they take hits, just fill in the little circles. They handily tell you how much health the model has at the beginning. When you fill in the little skull, the model is “Taken Out.” But don’t worry, they can come back. That’s what those other circles with numbers mean. Those are your “Icy Sponge” spots. Basically, when a model is Taken Out, they’re removed from the board. However, next turn they’ll get an Icy Sponge counter. They can trade that in right away to come back onto the field from the sidelines, with health equal to where the first Icy Sponge marker is, or they can stay out and rest up a bit more, coming in on a later turn and obviously having more health when they make it back out onto the pitch. Flipping the card over, we get to a very important number that’s a little bit hidden up in the upper-right corner. That’s a model’s Melee Zone. This is a very important number, as it determines which other models it can attack. Also, it’s a zone of control that enemies can enter into, but they can’t leave without incurring a Parting Blow (or Free Strike, for you Warmachine/Hordes players out there). Below that is the base size of the model. 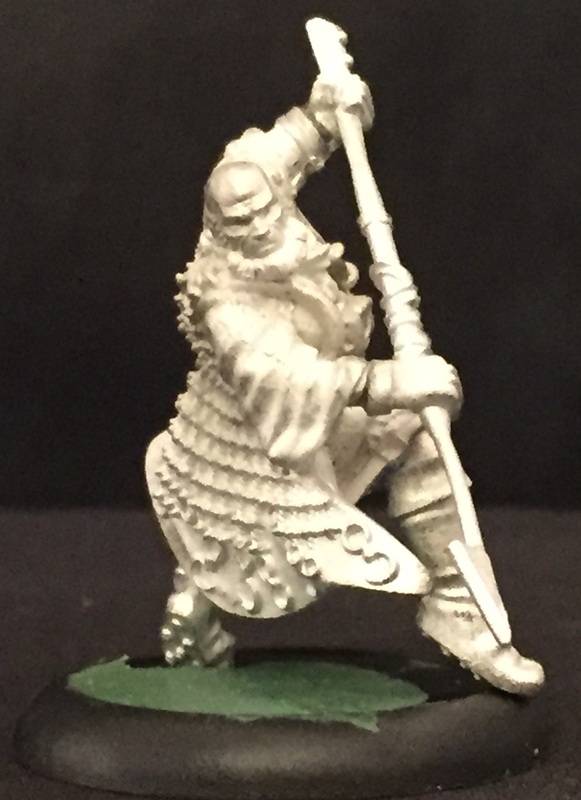 Guild Ball uses 30mm, 40mm, and 50mm bases. Though the vast majority of figures go on 30mm. After that we have the Playbook. I’ll get into the full details of this when I get to how to make an attack, but suffice to say this is the myriad things that a player can do when they successfully attack. Each circle (that’s not filled in grey) represents an option. Each of the numbers mean a certain amount of damage, but there’s also the different icons, as well as the color-filled (not the grey ones, but like the blue ones above) that also mean something. It looks complicated and imposing now, but it’s not hard to get a handle on later. Trust me. It’s one of those things that looks intimidating to start out with, but you quickly get into the swing of things. Below the Playbook we have the Character Plays. Yes, I know they’re named somewhat similarly. It did throw me off-guard slightly when I was first reading through the rules, but again, it was something I was able to separate out pretty quick. Character plays you can almost think of as “character spells.” They’re not really spells, but special things the player can do on their turn by spending Influence. These have a little stat block, too. So let’s go over it. You start out with the Play’s name. Then there’s the Cost, which is the cost in Influence to “cast.” Sometimes you’ll see a little GB symbol. That corresponds to the GB symbols in the Playbook. More on those later. Then there’s the RNG, which is the Range. If it’s a number, that’s the range in Inches. If it’s an S, that means “Self.” So the model making the Play can only target themselves with it. If it’s a P, that means that it’s activated during an Attack via the little GB symbols, and it will target the original target of said attack. The Zone is the size of the AOE (if there is any) created by the Play. Finally there’s Sustain. If it’s No, that’s easy, it doesn’t Sustain. If it’s a Yes, then that means the effects of the Play stay on the field until the end of the turn. Down at the bottom of the back of the card we have the player’s Traits. These will cross-reference with other certain abilities and Plays. The ones that I’ve seen come up most often are Male and Female, as certain characters have a bonus against the other gender type. Finally, there’s the Guild symbol, which lets you know which teams the player can play for. And then there’s the Season number. All the characters I have are Season 1, but Season 2 characters are due out soon. Ok, so yeah, as I mentioned, a lot going on with the stat cards. When I first started looking over the cards and the rules and whatnot, my initial impression was that the game was like Bushido mixed with Warmachine mixed with some fantasy sports action. Having that sort of mentality, I think, really helped me get familiar with the stat blocks quickly and eased my progress into the game. 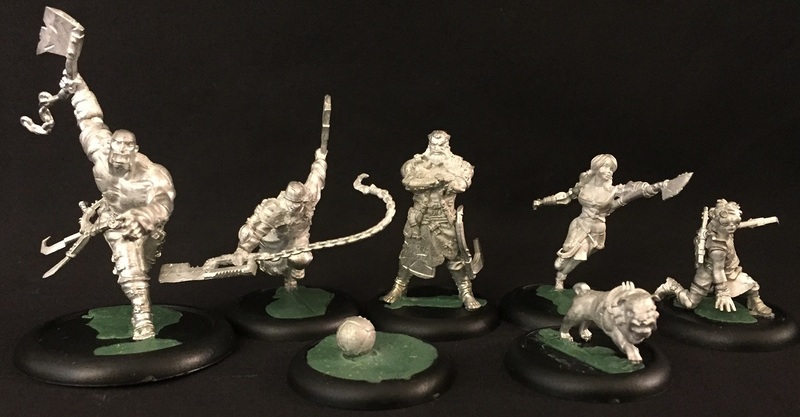 In fact, it’s easy to see the Guild Ball designers played Warmachine, as terms like “Directly Away/Toward,” “Pulse,” and “Aura” had their definitions taken exactly from that game. That’s not a bad thing, in my book, since Warmachine is generally agreed upon to have some of the tightest and most-concise rules out there. So that’s what a player’s stats look like, a look at the board, and telling you about all the various accessories. Let’s actually get to setting up and playing a game. Like many sports, there’s a bit of pre-game prep before actually kicking off. For starters, players have to decide what, if any terrain they want on the board. As I mentioned, it’s perfectly fine to play on an even and open pitch. If you want terrain, however, there are various keywords assigned to each piece so everyone has an equal understanding of how they work. Once terrain is figured out, each team is dealt 5 Guild Plot cards. This is a special deck of 12 cards that is shared between the two players. They offer special things that can happen in the game if certain requirements are met, such as letting you move a little bit after a goal, or make a special counter-attack when a player loses the ball. These plots change from season to season. So Season 1’s plots are being replaced by Season 2’s when they come out. Anyway, you get 5, but then discard 2, leaving you with 3 in your hand. Save those for later. Next, each player rolls a die. Reroll ties. High die gets to either kick or receive the ball. 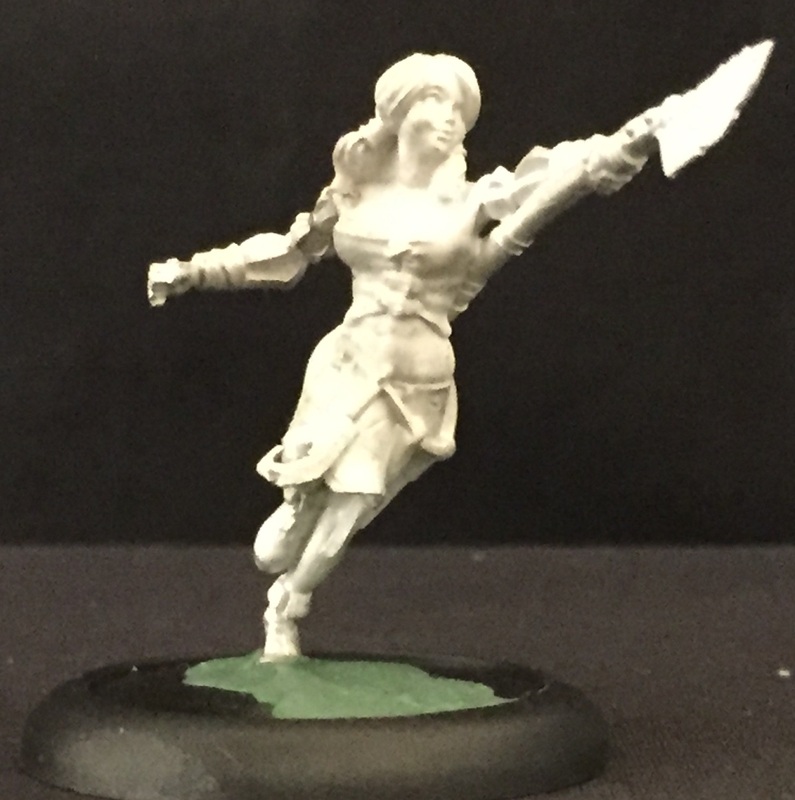 The kicking player picks their table edge and then deploys their team. They can be placed up to 10” onto the board from their edge. The Kicking player then gives the ball token to one of their players. 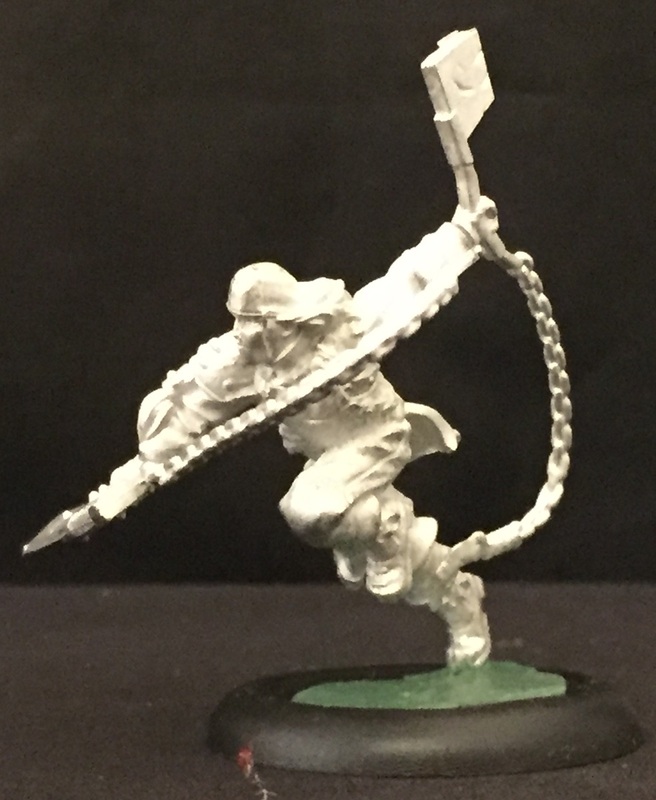 The receiving player then deploys their team, also up to 10” onto their board. The player with the ball then moves up to their Standard Move and kicks off, placing the ball using the standard kicking rules (which we’ll get to in a minute). If the kick doesn’t end up on the receiving player’s side of the board (I.E. – it’s a really weenie kick), then any of the receiving team’s players can be given the ball automatically. Otherwise, the first turn is ready to start. The receiving team automatically gets Initiative in the turn and you’re ready to go. So we’ve started the first turn… but what do you do during a turn? Well, there’s four phases in a turn: Initiative, Maintenance, Activation, and End. The first two and the last one are really quick. It’s the 3rd, the Activation phase, where most things happen. As such, I’ll give a quick overview of all four phases before diving into the 3rd like a player diving after a loose ball. The Initiative phase is simple. Both players roll 1d6, adding +1 to the roll for each unspent Momentum Point from the previous turn. Reroll ties. The player who rolls higher gets to choose who has Initiative that turn. The Maintenance Phase has 5 steps in it. The player who has Initiative goes through all 5 steps, followed by the other player. Step 1 is to resolve all conditions on their players. Step 2 is to give Icy Sponge tokens to each player who has been Taken Out. Step 3 is to return players to the pitch using the Icy Sponge rule (if you want to. As I mentioned above, you can keep players out longer so they come back with more health). Step 4 is to generate your Influence Pool by counting up the total Influence of your players on the field, adding 1 extra for each Goal you have scored. Step 5 is to allocate that Influence to your players. Remember, players have a maximum allowed amount of Influence they can have. Also, it is perfectly alright to give a player 0 Influence. Just don’t expect them to be doing a lot that turn. Skipping the Activation Phase for now, we get to the End Phase. Here, you simply remove all ongoing effects on the field as well as remove any unspent Influence (I.E. – it doesn’t build up from turn to turn. Use it or lose it, playa). So that leaves the Activation Phase. This is where the majority of your games of Guild Ball will take place. As you can tell from the name of it, this is where players activate their models in the hopes of positioning themselves better on the field, attacking enemy players, and trying to score goals. The game is an “alternating activations” style game, so one player activates a single model, doing everything that model will do for the turn, then their opponent activates a model. This goes back and forth until all players have activated. So, what can a model do when it’s activated? Lots! Or a little, depending on how much Influence they have on them (as given to them during the Maintenance Phase). During their turn a model can move, kick the ball, use a Character Play, and/or make an attack. Let’s go through them one at a time. Moving is the one thing a character can do “for free.” If you just want a figure to move up to their Standard Move, that doesn’t cost any Influence at all. They can just Jog to some place one the field. However, if you want a bit more, that’ll cost you. A Sprint lets a model move up to their Max Move, and costs 1 Influence. There’s also Charging. That’ll cost you 2 Influence. When you Charge, you can move up to your Max Move, but it must be in a straight line. When you’re done moving, you can make an attack (with a bonus +4 TAC, even), against an enemy model in your melee range. We’ll get to attacks in a bit. Note: You can only make 1 Move Action during a model’s activation. Otherwise, since a Jog is free, you’d theoretically get to anywhere on the board you wanted. On your turn, you can also kick the ball, if you have control of it. Models will automatically gain control of a loose ball if they move anywhere within 1” of it. At that point, the ball will “snap to” them. They can also drop off the ball during their turn for free. Simply place the ball within 1” of the model (so the reverse of gaining control, really). If you want to pass the ball or kick it to an open spot on the field, that requires a roll (and spending 1 Influence). This is where we get into the dice system of Guild Ball. It uses a “Dice Pool” and “Target Number” system. 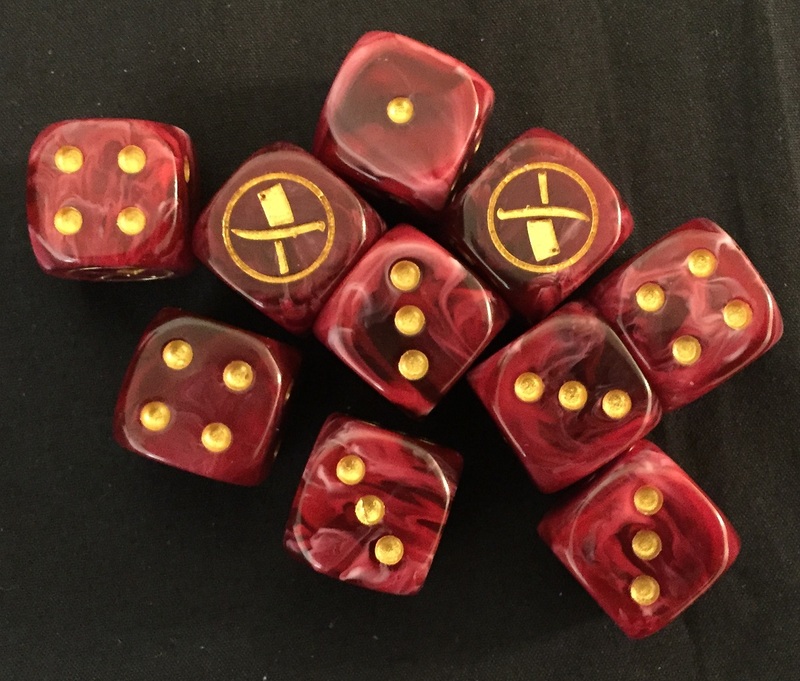 Basically, when you want to do many things (Kick, Use a Play that targets an enemy model, or Attack), you’ll first figure out how many dice go into your Dice Pool. Then you’ll figure out your Target Number. Then you’ll roll your dice and look for successes. In terms of Kicks, you start with your model’s Kick number. You then subtract dice if you have enemies around. You get -1 Die for each enemy model engaging you and for every enemy between you and where you want the ball to go. If you don’t have Line of Sight to your target, you get +1 to the Target Number. You also get +1 to your Target Number for each enemy model engaging your target (if you’re attempting a pass). Normally, the Target Number is 4+. And all you need is 1 Success (so one die that you roll to be a 4+) in order to get the ball right where you want it. If you don’t get that, the ball scatters using a special template. Shots on Goal are special forms of Kicks that, in addition to having to spend 1 Influence, you must also spend 1 Momentum in order to make the attempt. Momentum explained further down. That brings us to Attacks. A single Attack costs 1 Influence (unless you Charged, then it’s 2 Influence, but you get both a Sprint and an Attack, so considering you also get a bonus to your TAC, it’s quite a deal). You can keep making attacks as long as you’ve got Influence to spend. 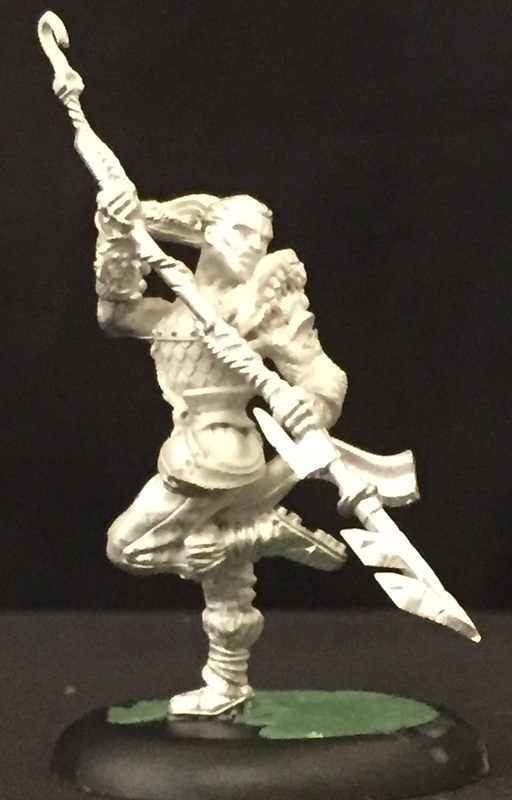 Attacks start out with a Dice Pool equal to your model’s TAC. Like before, you get -1 Die for each enemy (besides your target, of course) engaged with the model making the attack. 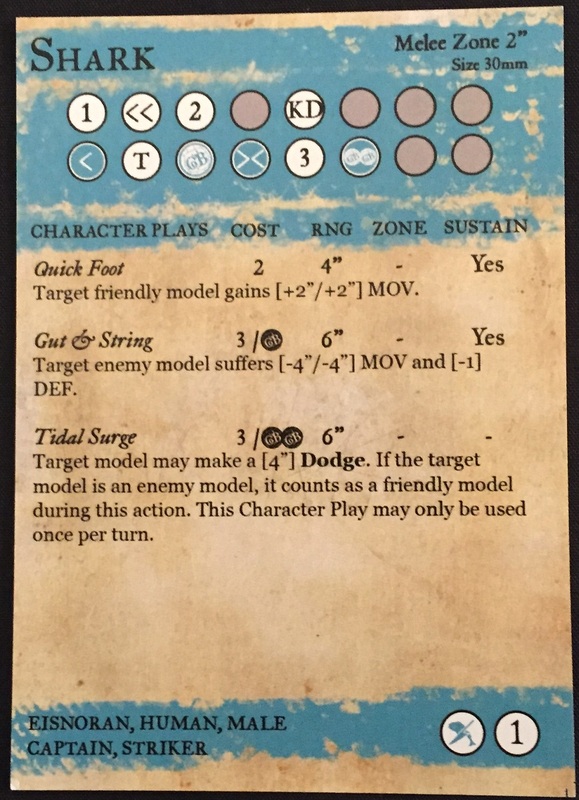 You also get +1 Die for each other friendly model (to the attacking model) that’s engaging the target model (besides yourself, of course). As I mentioned before, you get +4 TAC (I.E. - +4 Dice) if you Charged. If the target of the attack is Knocked Down, they get -1 DEF. If the target has cover (which is granted by being in certain types of terrain), the attacker gets -1 TAC. The Target Number of the attack is equal to the target’s Defense stat. So once you’ve got your dice pool, you roll. Any dice that equal or beat the Target Number are Hits. If the target of the attack has an Armor value, subtract Hits equal to that value. The number of dice left over are the “Net Hits.” This is where the Playbook comes in. A number: That’s how much damage you do to the Target. Simple. > : Push. The target model is moved 1” for each > shown. So >> would mean a 2” push. < : Dodge. The opposite of Push. This time, the model that made the attack can Dodge 1” for each arrow. T: Tackle. If the target currently has the ball, the attacking model takes control of it. GB: If it’s the little GB icon, that means you can use a Play from the attacking model’s playbook. KD: Knocked-down. The target model is Knocked Down. If there are multiple symbols in the circle, that means you get multiple effects. They can be applied in any order you choose. If the circle is filled in with a color (besides grey), that means that in addition to whatever effects are listed, you also gain 1 Momentum for your team. As you can see, with only one result generating damage, and that damage generally being 1-3 or so, it’s actually quite a bit of attacking required to take out an enemy model. Much of the time you’re going to be stealing the ball, moving models around, or making a Play. 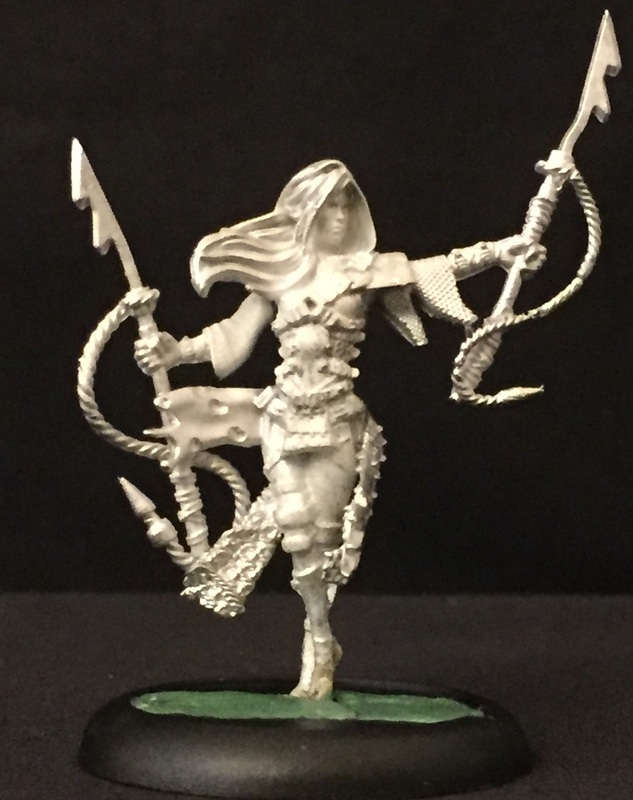 A funny thing about buying Plays that way: Say it’s a Ranged play you’re doing, you don’t have to specifically target the model you attacked. The rulebook example shows Model 1 Attacking Model 2, getting a Play result, and using it to use that Play on Model 3, several inches away. It’s a very interesting system. So I mentioned Momentum a couple times. You know it’s required to take a shot on goal. And at least one way it’s generated is potentially by making an Attack. But that’s just one way it can be spent and one way it can be gained. It can also be gained by Taking Out an enemy, successfully passing the ball to a teammate, and by scoring a goal (yes, you use a Momentum to take a shot, but if you score, you immediately get it back. Heck, you even get an extra Momentum if your Kick roll to score the goal had 2 or more 6’s rolled). I love Guild Ball. I really do. It’s right up there with Bushido as my favorite miniatures game. It ticks off quite a few boxes in my “I love when games do that” list and doesn’t check any of my “why on Earth would they do that?” list. What do I love about it? It’s skirmish-sized: As I get older, I find myself less interested in playing large-combat games. I like only needing 6 models to be able to play. That makes it fairly economical to get into. Alternating Activations: This means it’s never very far from being your turn. With “I Go. You Go” style games, it can feel like hours before it’s your turn again. “Imma go get a cheese sammich. Just take off my models you kill and then we’ll trade out when I get back.” That sort of thing doesn’t happen here. Lots of Options: The amount of things you can do during a model’s activation is almost intimidating at first. There’s movement options, play options, attack options, kicking options… So you can create a plan for what you want to do, and then constantly modify it based on what your opponent’s doing. Playbooks: This is basically a sub-set of the Options part. I love this unique aspect of the game. You might go into an attack just wanting to do damage, but you unlock a result that you’d maybe not think you’d get, and that changes up your whole plan for the turn. Positioning: While some teams and certain play-styles will see you charging in and hacking apart your enemies a lot, that doesn’t have to be the focus of your team. The Fishermen, for example, are all about board control. 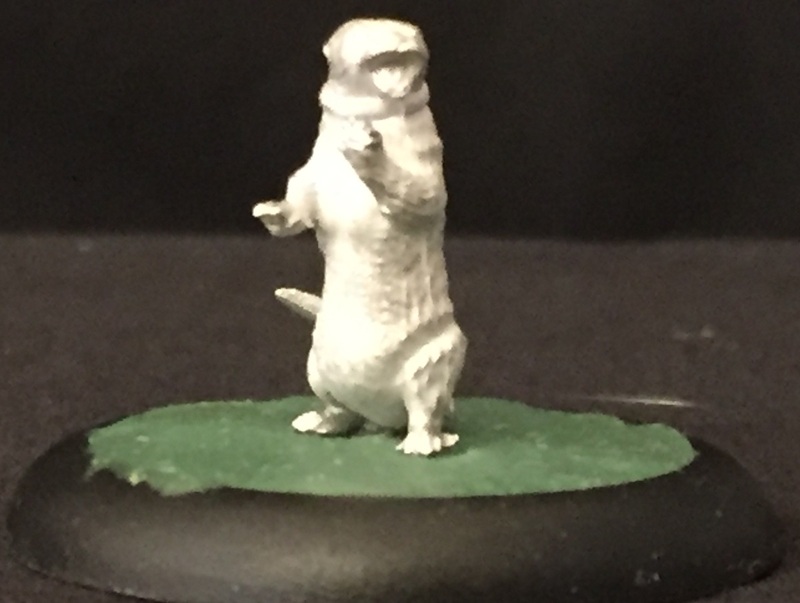 “I’m going to move your one model over here. I’m going to bolster my own movement and go running out to the wings, then I’m going to have your own model attack your other model over there.” All that can happen with the Fishermen. So yeah, I totally understand why my friend’s feeds have been filled with the game lately. I’m totally sold. 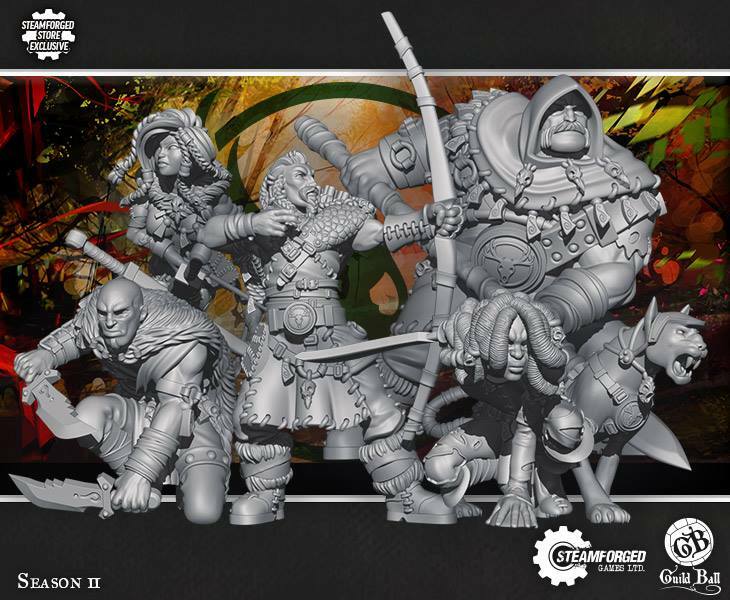 And, I mean, we’ve got the Hunter’s Guild coming out at Salute. I know I’d like a team with a bear mascot. I’ll probably pick one up at some point. And there we have it. 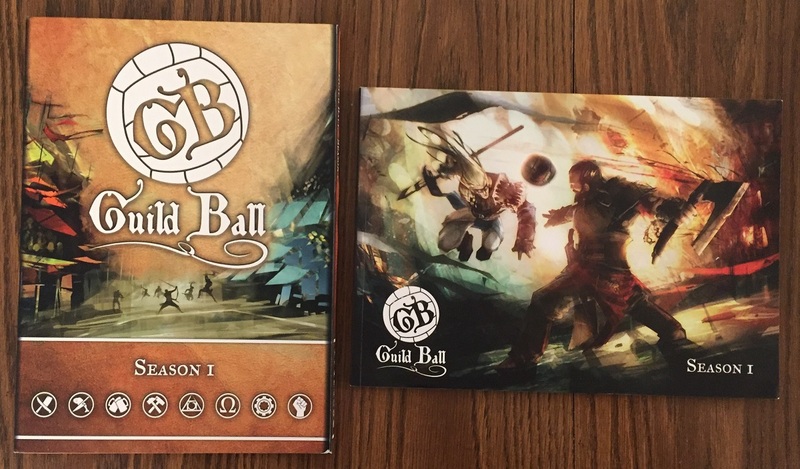 What are your thoughts about Guild Ball? Have you been bitten by the Guild Ball bug as well? 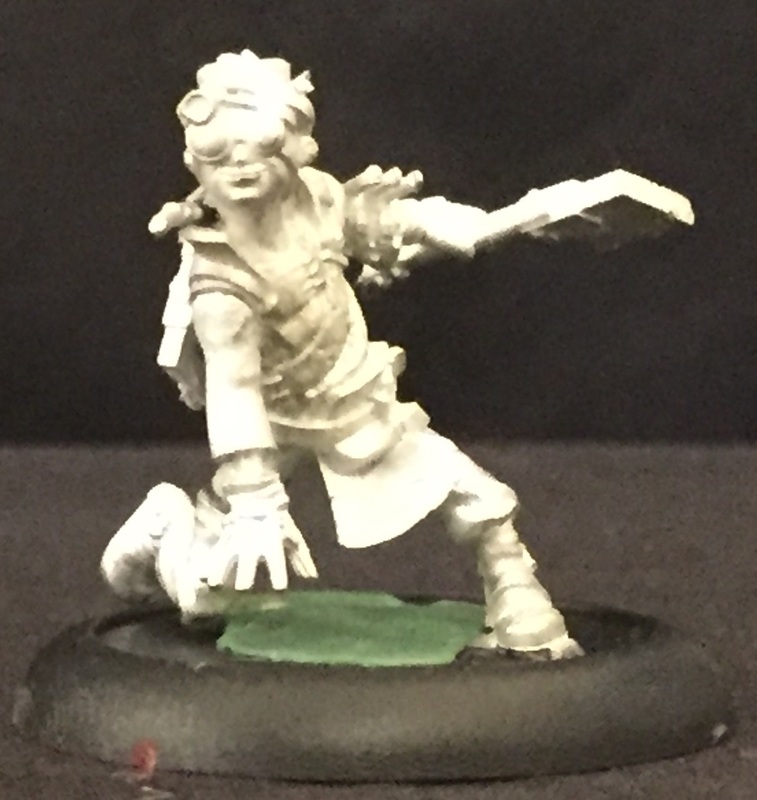 Be sure to check out the Steamforged Website and if you want to pick up Guild Ball, you can do so at your LGS or in the Steamforged webshop.